Which team do you think will win the World Series this fall? 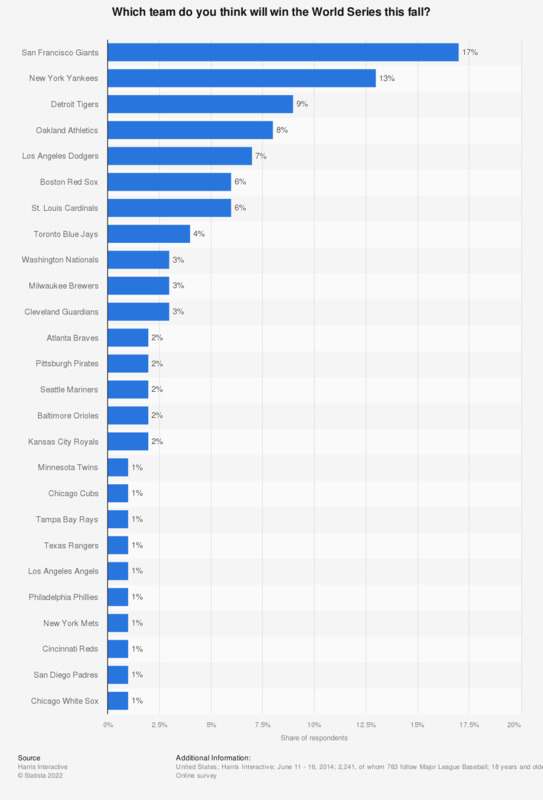 The statistic shows which team the survey respondents believe will win the Major League Baseball World Series in 2014. 13 percent of the survey respondents think that the New York Yankees will win the World Series in 2014. As of 2014, the World Series has been held a number of 110 times. Almost 50 percent of the total number of winning titles are split between three teams alone. Statistics on "Major League Baseball"
Regardless of what team you think will win, which one team do you least want to see make it to the World Series this fall? Which baseball team do you root for? Do you follow major league baseball or not?